I wanted to blog about our big gender reveal tonight, but I am having technical difficulties and am Mac (or i-Anything, really) challenged, so maybe I can get to it tomorrow night. In the midst of cursing all things technology-related but specifically the Mac, I realized that I never posted about how we broke the news to our families this time around. Much like last time, as I previously blogged, Chris and Andrea were the first to know, before I had even been to the doctor or knew how far along I was. Carney was the second, because she came in on one of the mornings I was (violently) ill and I thought she'd heard. We ended up telling our families shortly after, around 6 weeks, because we had a lot of family time planned around that period of time and we knew they'd suspect anyway. After that, though, we really didn't tell anyone else until close to 12 weeks when we were sure all was well (except Stephanie who guessed it before I could tell her in person, which you can read about here). 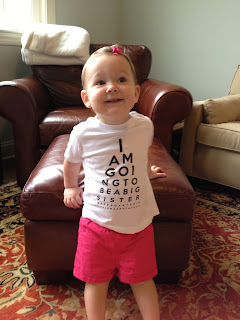 I wanted to think of a neat way to tell our families, and I thought it would be funny to let Lilly wear a t-shirt and see how long it took people to notice/read it. 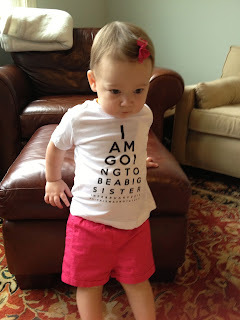 I searched and searched for the perfect shirt, and found a TON of cute "big sister" shirts (one of which I'm sure L will wear to the hospital when the time comes), but I wanted it to say "big sister to be" or something along those lines and I couldn't find anything that I loved. I ended up sending Dan three choices and he chose this one. Luckily, the customer service was great and the turnaround time was quick! We were in Charlotte visiting family mid-June, and although I wasn't as far along as we would have liked, we decided to tell our families because I as I mentioned before, I knew they would start suspecting when I wasn't drinking, etc. We put Lilly's shirt on at my parents' house when she woke up from her nap. Unfortunately, we were in a hurry because we were going to Chris and Andrea's for the evening. 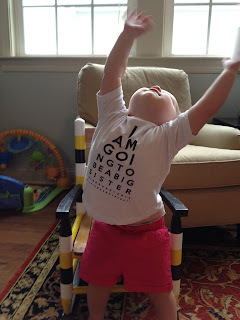 Neither of my parents were observant in the least, so I finally asked Lilly if she'd showed Mimi her new shirt. Mom and Dad seemed to be as surprised as we were, but of course very excited. We told Syd that day as well, but waited to tell Katy because I wanted her to have her baby first. Dan's family is far more observant, and my mother-in-law and father-in-law noticed Lilly's shirt almost immediately. My mother-in-law said she suspected it when she'd seen me earlier in the day, and everyone was very excited. When it came time to make the "official" (and by official I mean Facebook) announcement, I put Lilly in her shirt again and tried for a photo shoot. Of course she was totally non-cooperative for the most part (see below). And in the few where she actually smiled or even half-smiled, you can't read the shirt. Of course. In most of them she really looks like "UGH I like being an only child." "I am undecided as to whether this is actually good news..."
"Let's compromise. It's okay news." "And by 'okay' I meant it is HILARIOUS that you think I'm giving up only child status." "Ugh. You're actually serious?! Ughhhhh!!!!!" "It's really a joke, right?" "Ugh this is the worst news ever." "And why do you keep making me sit in this chair?!?!?! I WANT TO RUN!!!" "Okay, I'll say cheese, d@mnit. Slash give you my monster face. But I'm getting out of the chair." Whew, those took a lot longer than expected to upload. Hope everyone had a wonderful hump day! Cute shirt! Love the announcement! Ah, total cuteness! I still can't believe how big she has gotten since I first started reading your blog :) If you're ever in the DC area we should meet up! Ahhhh she is SO BIG Megan, they grow too fast!! Perhaps she and your Sofie should meet so Sofs can teach L how to grow some hair! I am not sure how I didn't realize you were in the DC area, but of course I'd love to meet, and likewise if you're ever in Raleigh! Dan and I were saying just the other night that we have never been to DC together and it would be a fun trip.